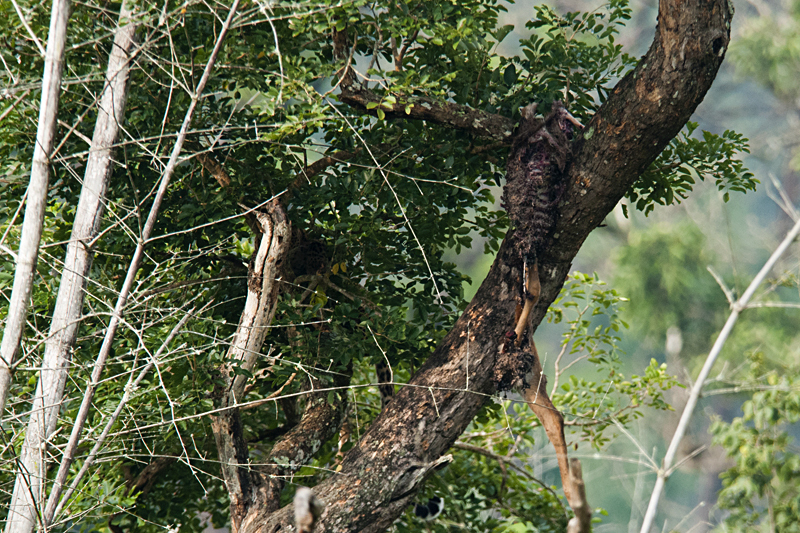 It had been raining Leopards on this particular trip to Bandipur National Park. After the lovely sighting of the perfectly camouflaged Leopard, we again sighted a Leopard with a Spotted Deer kill while on this safari. Once again the Leopard had chosen a tree that was far away from the safari road and we barely managed to get some images at 600mm focal length. 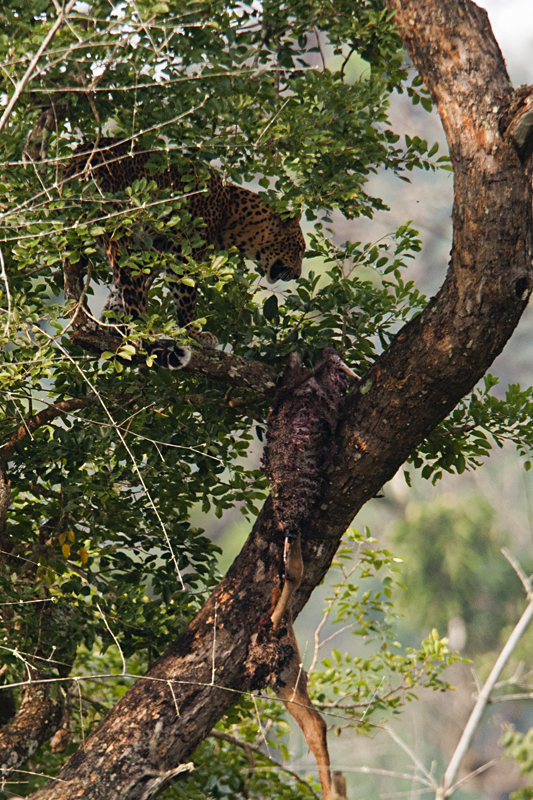 It was obvious that one of the safari vehicles had spotted the Leopard while it climbed up the tree with the carcass as otherwise it would have been impossible to spot it. 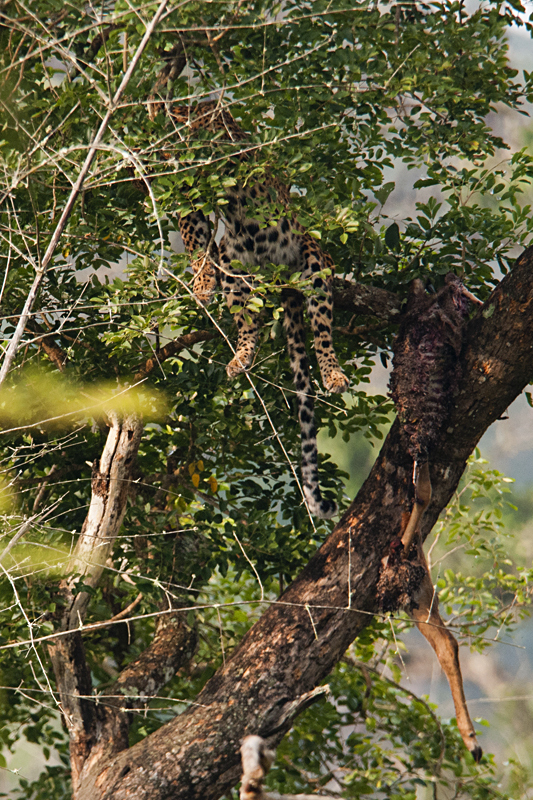 When we reached the location, the Leopard was resting on a branch a little away from where the carcass was dangling. 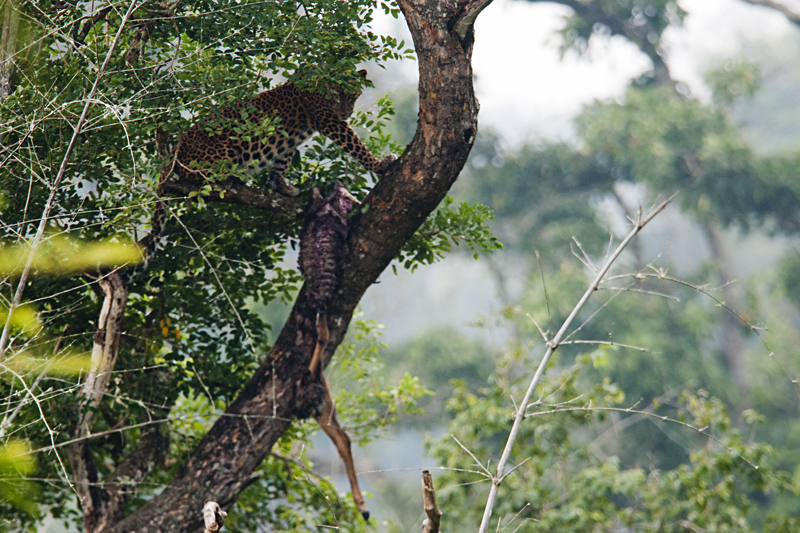 Something had spooked the Leopard; it may have probably been another Leopard hidden at the base of the tree or some scavengers like crows or vultures that were close by. 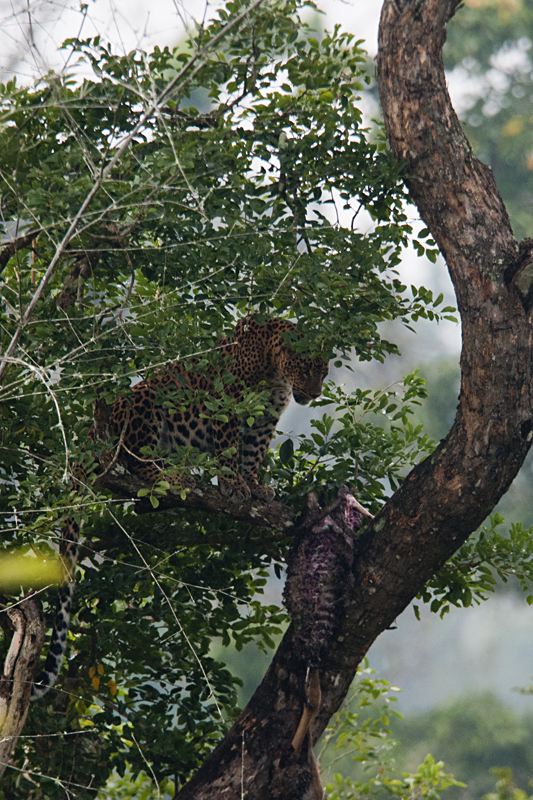 Whatever it was, the Leopard was restless and it was hovering close to the carcass. A few minutes later, the Leopard looked in the general direction of the tourists – there was a long trail of vehicles wanting to get a glimpse. 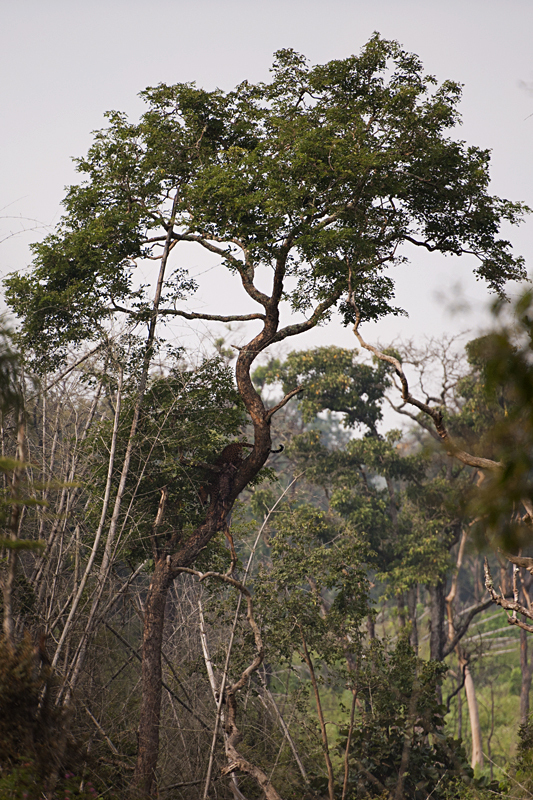 After a few nervous moments, the Leopard receded into a more shaded branch of the tree to rest. 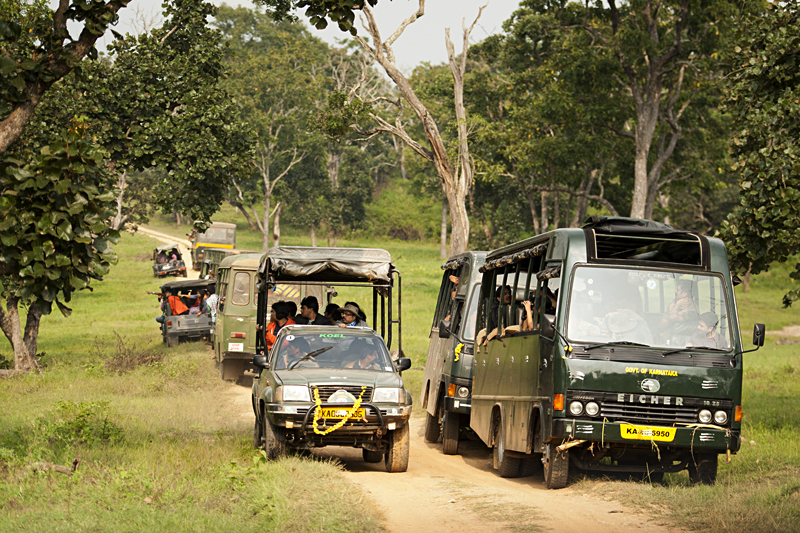 However, the traffic jam that was created inside the forest continued to remain unabated. The sleeping Leopard was motivation enough for us to move on in search of more interesting game. That is an excellent sighting. Nice captures! Happy you spotting that wonderful animal. We just returned from the Mara and were three days out to spot a Leopard without success.